Zombie Goombas are undead, near-mindless Goombas seen in The Super Mario Bros. Super Show! 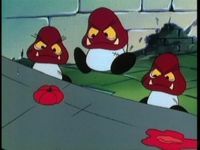 episode "Count Koopula", where they are shown to create Count Koopula's tomato sauce in the bowels of his castle. From afar, Zombie Goombas simply resemble regular Goombas, though when seen up close, scars and stitching can be seen on them. Zombie Goombas are also shown to have yellow colored eyes, though some Zombie Goombas are shown to have white eyes. Zombie Goombas evidently aren't very intelligent and are often shown to simply chant and mutter until alerted to something. This page was last edited on February 16, 2018, at 21:01.